(CNN) -- William Kamkwamba dreamed of powering his village with the only resource that was freely available to him. 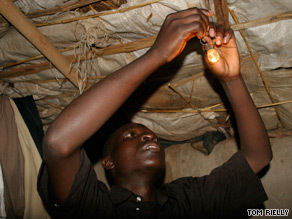 William Kamkwamba fits a lightbulb to a house in his village in Malawi. His native Malawi had gone through one of its worst droughts seven years ago, killing thousands. His family and others were surviving on one meal a day. The red soil in his Masitala hometown was parched, leaving his father, a farmer, without any income. But amid all the shortages, one thing was still abundant. "I wanted to do something to help and change things," he said. "Then I said to myself, 'If they can make electricity out of wind, I can try, too.'" Kamkwamba was kicked out of school when he couldn't pay $80 in school fees, and he spent his days at the library, where a book with photographs of windmills caught his eye. "I thought, this thing exists in this book, it means someone else managed to build this machine," he said. Armed with the book, the then-14-year-old taught himself to build windmills. He scoured through junkyards for items, including bicycle parts, plastic pipes, tractor fans and car batteries. For the tower, he collected wood from blue-gum trees. "Everyone laughed at me when I told them I was building a windmill. They thought I was crazy," he said. "Then I started telling them I was just playing with the parts. That sounded more normal." That was 2002. Now, he has five windmills, the tallest at 37 feet. He built one at an area school that he used to teach classes on windmill-building. The windmills generate electricity and pump water in his hometown, north of the capital, Lilongwe. Neighbors regularly trek across the dusty footpaths to his house to charge their cellphones. Others stop by to listen to Malawian reggae music blaring from a radio. When he started building the first windmill in 2002, word that he was "crazy" spread all over his village. Some people said he was bewitched -- a common description for people with perplexing behavior in some African cultures. "All of us, even my mother, thought that he had gone mad," said his sister Doris Kamkwamba. Villagers would surround him to snicker and point, Kamkwamba said. Ignoring them, he would quietly bolt pieces using a screwdriver made of a heated nail attached to a corncob. The heat -- from both the crowd and the melted, flattened pipes he used as blades -- did not deter him. Three months later, his first windmill churned to life as relief swept over him. As the blades whirled, a bulb attached to the windmill flickered on. "I wanted to finish it just to prove them wrong," he said. "I knew people would then stop thinking I was crazy." Kamkwamba, now 22, is a student at the African Leadership Academy, an elite South African school for young leaders. Donors pay for his education. His story has turned him into a globetrotter. Former U.S. Vice President Al Gore, an avid advocate of green living, has applauded his work. Kamkwamba is invited to events worldwide to share his experience with entrepreneurs. During a recent trip to Palm Springs, California, he saw a real windmill for the first time -- lofty and majestic -- a far cry from the wobbly, wooden structures that spin in his backyard. Former Associated Press correspondent Bryan Mealer, who covered Africa, wrote a book, "The Boy Who Harnessed the Wind," after hearing Kamkwamba's story. The book was released in the United States last week. Mealer, a native of San Antonio, Texas, said he lived with Kamkwamba in his village for months to write the book. The story was a refreshing change after years of covering bloody conflicts in the region, Mealer said. Kamkwamba is part of a generation of Africans who are not waiting for their governments or aid groups to come to their rescue, according to the author. "They are seizing opportunities and technology, and finding solutions to their own problems," Mealer said. "One of the keys of his success is ... he's never wanted to rest on his laurels."